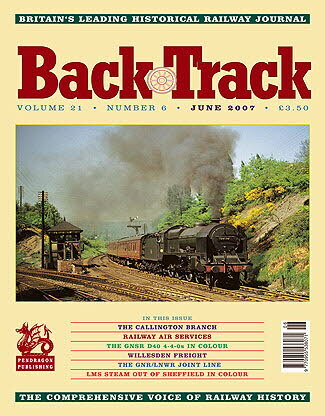 Railway Magazine | BackTrack June 2007 journal from Pendragon Publishing. Home Counties North - colour photos by David Idle at the southern end of the West Coast Main Line in the early 1960s. Willesden Freight - Keith Miles recalls freight workings in and out of the yards at Willesden. A touch of the Bahamas in Bury - three photos by Ray Farrell of the preserved 'Jubilee' 5596 Bahamas during its stay in Bury in 1968. The Callington Branch - Part One - David Thrower describes the origins and operation of this Devon branch line. Class 47s Stratford Style - three colour shots by G.R. Mortimer. Railways for Posterity - Part Two - The Canal Factor and Early Railway 'Pioneers' - A. J. Mullay continues his study of the development of the heritage movement. The D40 Class 4-4-0s of the Great North of Scotland Railway - three pages of colour photographs. South of Sheffield - four LMS classes photographed by Derek Penney on the Midland route. In a Brown Study on the Brighton - historic Loco Publishing Co. coloured postcards of LBSCR engines. Some Reflections on the Narrow Gauge - Part Three of Michael Rutherford's wide-ranging review. 1,500V DC - three colour photos by Brian Magilton of the Manchester-Woodhead-Sheffield electrics. Packets and Peas - Â Jeffery Grayer writes about they heyday of Kingston Wharf in Shoreham Harbour and the use there of the SECR P Class tanks. Rails in the Air - John King tells the story of the development of Railway Air Services, with particular reference to those of the LMS. Redmile for Belvoir - David Gilks traces one of the lost railways of the East Midlands, the GNR/LNWR Joint Line.